Humans need over 100 different nutrients for maintaining health and well-being. Given that a typical serving of meat and vegetables may not provide significant nutrient value in terms of daily requirements, it is very beneficial to derive your micro-nutrients by using spices and herbs. A spice is a seed, fruit, root, bark or other plant substance used for flavoring food. Herbs are leaves, flowers or stems of plants used for the same purpose. Spices may be ground into a powder for convenience. Western foods may use only minimal number of spices and herbs, and most people are not accustomed to the flavor of spicy dishes, but the more you use them, the more your mouth will grow accustomed to them. Keep in mind also that not all spices are “hot” in your mouth. Many spices simply add new flavors that you may not know. One of the easiest ways to make spices and herbs part of your diet and gain the nutrients contained in them without having to eat a large quantity of energy-containing foods is to consume pickles and chutneys with your meals. Pickles can be made not just from cucumbers, but from many vegetables and even fruits, such as apples, combined with various spices and cooked briefly and then marinated in the refrigerator for a short time. 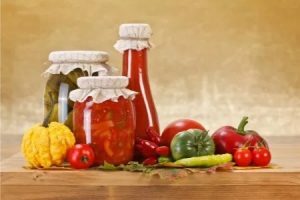 Chutneys are sauces, relishes, and garnishes that may contain a variety of mixtures including fruits, tomatoes, vinegar, and spices mixed to be sweet, sour, or both. With this in mind, I will be blogging various recipes for different types of pickles and chutneys on this website from time to time. Any one of these can be served as delectable accompaniment to broiled, baked, barbequed or smoked foods, like chicken, beef or lamb. Another way to enjoy them is to accompany a salad that has no dressing on it. After taking a few bites of salad, take a bite of the pickle or a spoonful of the chutney. When you chew the salad again, you not only enjoy the refreshing taste of individual salad ingredients, but also clean the taste buds. Sipping warm water enhances the whole experience.